This week's announcement that scientists are confident they have discovered the Higgs boson particle, sometimes called the God particle, is important because it is both a key building block in the universe and highlights the value of scientific collaboration. Scientists said Thursday that they believe they have discovered the elusive Higgs boson particle, sometimes called "the God particle," that is theorized to be a crucial building block of the universe. It is an important development not only because it explains why sub-atomic particles have mass but also because it highlights the value of the collaborative spirit that led to its discovery. The announcement is a step forward from July, according to Philippe DiStefano from Queens University in Kingston, Ont., when physicists working at the Large Hadron Collider near the French-Swiss border said they had found a particle that was "consistent" with the Higgs boson. "They’re sort of pinning down the properties of the particle a bit better than they did initially," says DiStefano, an associate professor of physics and astronomy. According to a release from the European Organization for Nuclear Research, or CERN, determining whether the discovery was in fact the Higgs boson depends on its quantum properties and how it interacts with other particles. After going through their entire data set from 2012, the results "strongly indicate" they have found the elusive particle. First theorized almost 50 years ago by British physicist Peter Higgs and others, the Higgs boson is the only particle yet to be observed in the Standard Model of Physics, which basically explains how the basic building blocks of matter interact. VIDEO: What you need to know about the 'God particle'"
"The Higgs field is everywhere around us, and all particles are moving in the presence of this field," said William Trischuk, a professor of physics at the University of Toronto. All these particles "interact more or less strongly with it, and they are either slowed down or not slowed down so much and that's what gives them mass." "The heavier ones interact strongly with this field and the light ones interact very weakly with this field." Trischuk is part of the ATLAS collaboration, which is one of two experiments seeking out the Higgs using the Large Hadron Collider. "We hate calling it the God particle but the reason it picked that up is because it goes out and touches every other particle and gives them their property, which is their mass," Trischuk said. Still, while the Higgs boson is fundamental to the universe itself, it's unclear what impact this discovery will have on the average person, DiStefano said. "I don’t think that anyone can guarantee what type of outcome on any time scale," he said. "This is fundamental physics so it's hard to know in advance what, if any, of the outcomes will be." However, other scientific breakthroughs have eventually led to tangible impacts on daily life. For example, positrons, which were discovered in the 1930s, are now used in medical scanners, DiStefano pointed out. There is more work to be done in terms of nailing down the properties of the Higgs boson. For instance, Trischuk said, scientists can go further in trying to determine the mass of the particle. Currently physicists have reported its mass to be either 125 or 126 GeV. "In five or 10 years one of the interesting things will be, is it 125.1 or 126.3 GeV? And that may have some consequences for the predictions" throughout the world of physics. 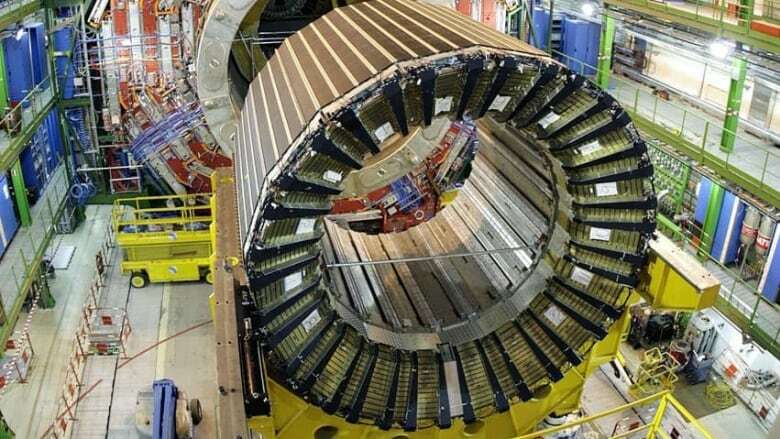 The release from CERN also said it remains "an open question, however, whether this is the Higgs boson of the Standard Model of particle physics, or possibly the lightest of several bosons predicted in some theories that go beyond the Standard Model," according to the release from CERN. Itay Yavin, assistant professor for theoretical particle physics at McMaster University and the Perimeter Institute in Waterloo, said there are a number of particles that are nearly identical to each other except for their mass. For instance, a muon has nearly the same properties as electrons but a different mass. It is possible that there is more than one Higgs boson, with each affecting different particles, although the Standard Model currently only allows for one. However, the evidence so far suggests that scientists have in fact found the Higgs boson, which in turn bolsters the Standard Model, Yavin said. "Now, scientifically, it shows that the theory that we have of particles and forces is basically correct." Fortunately for Higgs boson seekers, the Large Hadron Collider is currently being upgraded over the next two years so it can smash atoms together with more energy, which will help gather more data to delve deeper into the mysteries of the Higgs boson. That higher energy allows for the detection of a possible heavier Higgs particle, if such a thing even exists, along with the one that scientists say they have discovered, Yavin said. The discovery of the Higgs boson also points to the value of the $10-billion Large Hadron Collider and the collaborative spirit behind the massive endeavour to uncover a fundamental building block of the universe, Trischuk said. "It was the quest for the Higgs that brought us all together over the last 15 years from five continents and [6,000] people to work together," said Trischuk. That sentiment was echoed by Yavin. "By collaborating, we can unlock one of deepest mysteries in nature and discover a particle that was predicted on paper some 50 or so years ago," he said. "It's really a remarkable testimony about everything that is good about the human spirit, to collaborate and to think deeply about the universe." In terms of finally settling the question of whether scientists have discovered the Higgs boson with absolute confidence, Trischuk said that may be unlikely and that the answer, instead, might come in the form of successive approximations approaching certainty. "But I think from here on out we're going to stop calling it a Higgs-like boson and we'll call it a Higgs boson."